What a great way to eat your vitamins! 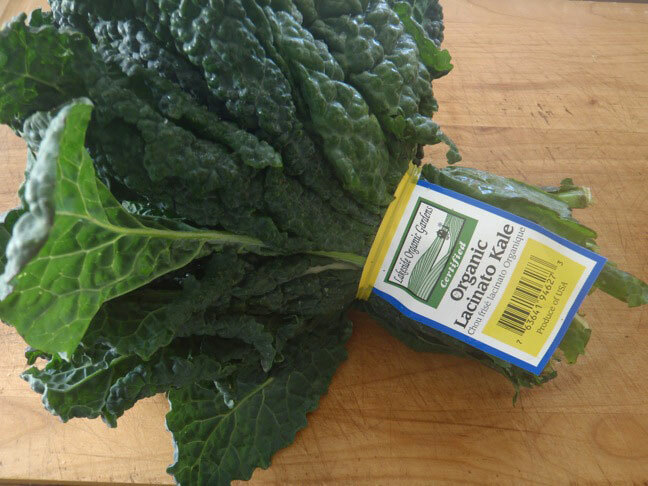 Kale is packed with them, and this delicious spread is a fantastic addition to sandwiches, meat, chicken, fish, pasta, rice . . . pretty much everything! This recipe is really quite similar to traditional pesto, which is made with fresh basil and pine nuts. When I make a pesto with kale, I like to use pecans — they have a slightly sweet, maple taste, which balances the occasionally bitter taste of the kale. My favorite way to eat this pesto is to spread it on a slice of warm, rustic bread with tomato slices on top! To toast the nuts, preheat the oven to 375 degrees and spread the nuts out evenly on a baking sheet. The nuts are done when they are very aromatic and golden brown, about four minutes. Stay with them, though, because they can go from perfect to burnt quickly! Remove any tough stems from the kale and break the leaves into a few pieces each. In a food processor, make the pesto by blending the kale with the garlic, Parmesan, and pecans. Then, gradually pour in the olive oil and blend until smooth. Season to taste with salt and pepper. It's critical to toast any nuts you use before adding them to a recipe. Toasting them draws their oils to the surface, bringing out all of their flavor. You can often purchase nuts already toasted. Trader Joe's carries toasted pecan pieces. I use 6 cloves of garlic, because I love the strong flavor, however, you can use as much or little as you'd like.